هذه قائمة أكبر المباني في العالم، مرتبة المباني حول العالم حسب الحجم والمساحة. وتشير كلمة المبنى في هذه القائمة إلى أي بناء منفرد يكون مناسبا لإقامة البشر صفة دائمة. وهناك استثنائات والتي تشمل المصانع والمستودعات. و يعتبر مصنع بوينغ إفريت بولاية واشنطن، الولايات المتحدة أكبر مبنى في العالم من حيث الحجم ومطار دبي الدولي أكبر مبنى من حيث المساحة الإجمالية. This list ranks the buildings throughout the world with the largest amount of usable space. 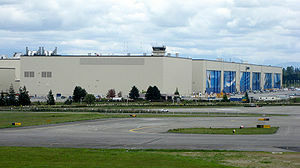 بوينغ's Everett Factory is currently the world's largest, used to assemble a selection of the company's largest مركبة جوية, originally built for construction of the 747. This building is 13.3 million m³ (472 million cu ft) and covers 398,000 m² (98.3 acres) of land. The Aerium was built to house the construction of a giant سفينة هوائية, although the airship was never completed. This building now houses an indoor, artificial tropical resort. ناسا's 160 m tall مبنى تجهيز الصواريخ was originally built to enable simultaneous assembly and shelter for four ساتورن 5s. This list ranks the top 25 buildings throughout the world with the largest amount of floor area. Upon its opening in October 2008, Terminal 3 at Dubai International Airport at 1.5 million m² (16.1 million sq ft, or 370 acres) of floor space surpassed the former leader, the Aalsmeer Flower Auction (990,000 m², or 10.6 million sq ft). Terminal 3 has a capacity of 43 million passengers, which by itself would be enough to place Dubai among the 20 busiest airports in the world by passenger traffic. For its part, the Aalsmeer Auction sees about 19 million flowers sold every day. This list of special categories includes a variety of buildings which are the largest of their type. This is a list of the world's 14 largest مركز تسوقs, based on gross leasable area (GLA) rather than total area. SM City North EDSA كيزون (مدينة), الفلبين 460,000 m² (4.74 million sq ft) It includes City Center Building, The Annex, The Block, Carpark Building and SkyGarden. Currently the largest mall in Asia after Golden Resources Mall, second largest mall in the world and largest shopping mall in Southeast Asia. Central World بانكوك, تايلاند 429,500 m² (4.62 million sq ft) 550,000 m² (5.92 million sq ft) Area of the full complex is 1,024,000 m² including two skyscrapers. ^ Tesco Distribution CentreTPE Consulting Engineers نسخة محفوظة 15 نوفمبر 2017 على موقع واي باك مشين. ^ GM Renaissance Center - Project Facts. Skidmore Ownings & Merrill. Retrieved on August 21, 2009. [وصلة مكسورة] نسخة محفوظة 21 مارس 2012 على موقع واي باك مشين. ^ Priddle, Alisa (May 12, 2009).Chrysler's tech center called a 'good asset'. The Detroit News. Retrieved on June 28, 2009. ^ JNTO Website | Find a Location | Nara | Nara-koen Park (Todai-ji Temple), اليابان, retrieved on February 5, 2009 نسخة محفوظة 09 نوفمبر 2017 على موقع واي باك مشين.